Product prices and availability are accurate as of 2019-04-19 06:46:13 CDT and are subject to change. Any price and availability information displayed on http://www.amazon.com/ at the time of purchase will apply to the purchase of this product. Wiley X eyewear was originally built to exceed the demanding standards of the US Military. These Legend glasses feature polarized gold lens with a gloss brown frame. These striking sunglasses offer the greatest and durability thanks to 100% UVA/UVB protection with distortion-free clarity and T-Shell lens coating. 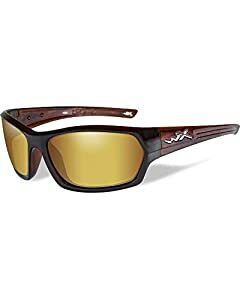 Never be blinded while you're on the go in Wiley X Eyewear.